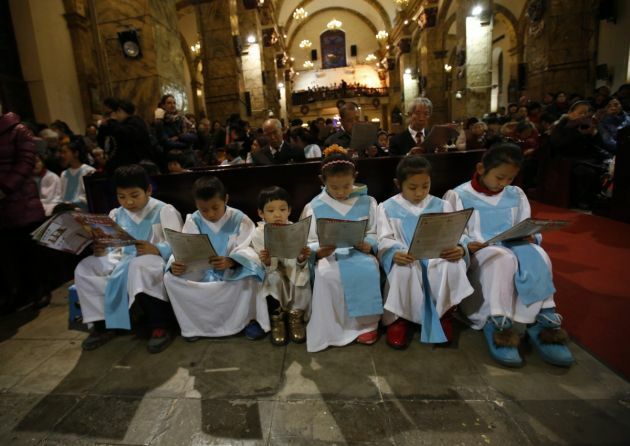 (Photo: REUTERS / Kim Kyung-Hoon)Children attend a Christmas mass at a Catholic church in Beijing December 24, 2014. Christmas is not a traditional festival in China but is growing in popularity, especially in more metropolitan areas where young people go out to celebrate, give gifts and decorate their homes. Christians have prayed in Hong Kong for China to stop repressing religious freedom. The prayer's theme on May 3 was "Safeguard religious freedom for believers of the mainland today and of Hong Kong tomorrow," Ucanews reports. It was jointly organized by Hong Kong's Justice and Peace Commission, Christians for Hong Kong Society, Hong Kong Christian Fellowship of City Concern and Hong Kong Christian Institute. The 40 participants met outside the liaison office of the Central People's Government to sing hymns, read a joint statement, post crosses on a map of China and march around the building. Commission project officer Or Yan-yan told ucanews.com that Catholics were very upset as they kept hearing news about the closure of mainland churches and restrictions on religion. "Hong Kong, as the place closest to China, should speak out for those who are isolated and helpless to fight suppression," she said. She hoped believers in mainland China would see support from their brothers and sisters in Hong Kong and let Chinese authorities know that "even though our strength is so small to make any changes, we still want them not to infringe human rights arbitrarily." Rev. Lau Chi Hung of Christian City Mission Church told ucanews.com that the prayer represents persistence. "As long as the problem exists, we still need to speak out," he said. The four groups that initiated the prayer and two other groups — Christians To The World and Yellow Umbrella Christian Base Community — issued a joint statement. It called on the Chinese government to stop suppressing religious freedom, particularly in Henan province where the situation is severe. It stated that officials had ordered believers not to gather, drove away unregistered underground priests, confiscated sacred objects and books, and threatened believers by deducting subsidies from the elderly and preventing their children from attending school. These were violations of China's constitution, it said, the International Covenant on Civil and Political Rights and the Convention on Children's Rights, the statement said. China's government was called on to immediately stop the seizure of house and underground churches, the suppression of religious personnel who have not registered with the government. It also called for halting the removal of crosses from churches, and the installation of video surveillance cameras in religious places. It also was urged to guarantee minors' religious freedom and to release all clerics and believers who have been arrested arbitrarily. This includes the apprehension of Bishop Su Zhimin and Father Liu Hong-geng of Baoding Diocese of Hebei province, Protestant ministers and house church leaders. The English version of the statement was to be sent to all consulates in Hong Kong and international human rights organizations in an effort to create international concern.